So, I've started my role as the Collection Development Leader for my library and I'm slooooowly learning the ropes. One tool I've been using a lot already is Google Keep. 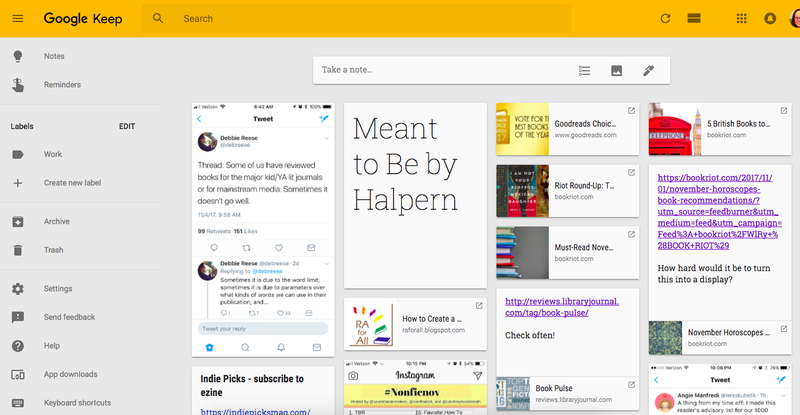 Google Keep is a free app and web tool that's part of the Google Suite. Basically, it's a digital bulletin board where you can make notes, keep lists, pin links, add photos, etc. I am a person who loves to read about books and reading. I love perusing Book Riot for their recommendations and checking out what people are reading on Litsy. I have been known to view online publisher book previews at home on my day off. I love making lists of books I'm interested in reading, even if I know I'll only have time to get to a tenth of them. I've done that for a long time, not just because I'm now a collection development librarian. We talk a lot about work-life balance and, even though my work is something that I LOVE and researching new books is something I sometimes do for fun, it could all too easily turn into me working all the time, around the clock. If I was constantly bringing up our library catalog to check if we have books or pulling up our vendor's site to add books to carts, I would be working all the time. So I wanted a tool that would allow me to save relevant links, lists, etc. for further investigation when I'm back at my desk. I needed an online tool so that it could be accessed on multiple devices and I needed something that has an iPhone app so that it would be with me where I am. That way, instead of digging out my bullet journal to jot down the URL to the amazing Rich in Color, the diverse books release calendar, I can add a link from Chrome or my phone or snap a screenshot so I remember to look it up later. I don't have to obsess about something in hopes I'll remember it on Monday when I'm at my desk. I can quickly note it right where I am and then go back to living my life. I jot down titles that I want to check and see if we have. This is great for when I'm hearing about a book during casual conversation, etc. and I don't want to forget. I snap and save photos of new books or book displays at the bookstore when my husband and I are browsing. I keep lists of book display and book list ideas that I can add to whenever something occurs to me (no more scrambling for themes on the first of the month!). When I'm scrolling through my blog subscriptions on Newsblur, I can save links to posts that I want to read in close detail, so I can catch up on my blogroll as I'm watching TV or something but not miss anything that might be useful in my job. I keep resource links saved in there that I want to check regularly. Since I can make notes about the links, I can note what I want to explore when I have time, what I want to check regularly, etc. I'm sure there are other similar organizational apps out there - what do you use to keep notes about new books or trends you hear about? ?